I, for one, was thrilled to see that there are three streams that speak thoroughly to me and my interests, as well as many other stand-alone sessions that feature writers and editors I admire (and, yes, Dissent Within is one of these!). The streams I’m excited about are Protest and Persist, Asia What?, and Harry Potter Day—the first two probably come as no surprise, given what I tend to write about here. The program works for me as a critical race scholar, a parent, and an Asian Australian living in Melbourne. Many of the program sessions involve members of the Asian Australian Research Studies Network (AASRN), which I convene. Seeing their insightful, savvy work brought before a larger audience is particularly satisfying. The ‘Asia What?’ series of events is an excellent example of the thoughtful, challenging conversations fostered by the Asian Australian Democracy Caucus (AADC) and having access to the broader MWF community is a boon. Don’t get me started about trying to decide how to get to all these sessions, let alone those featuring Tony Ayres, Shaun Tan and Kyo Maclear, and Kevin “Crazy Rich Asians” Kwan. As happy as I am about these program elements, I know there will be those who are unhappy and disapproving. There are two reasons for this. First, there are always those who are unhappy and disapproving. Second, and less facetiously, cultural festivals occupy always contested terrain. Particularly for literary festivals, there is constant tension around the literary and the popular debates about the diversity of speakers/authors invited—or not. It goes to the foundational issue of what purpose literary festivals serve. From the start, the premise of literary festivals is exclusive in terms of levels of facility with language and expression. The festival slogan is 'For everyone who reads'. For Asian-Australian writers, speaking at writers festivals to majority–white audiences can be an important, but fraught, experience. These writers can feel that they’re narrowly categorised; only invited to be part of panels about being a migrant or about race. "Who is listening and participating at these festivals is as important as who is invited to take the stage." They are often the only person of colour in a session and asked the ‘ethnic’ questions. Ot they are in the spotlight as representative of their cultural background. They may have excellent things to say on all these issues, but only being approached on these topics excludes their perspectives on others and can cause further trauma for those sharing their experiences. Tom Cho created a fake MWF program to interrogate the levels of conservatism and tokenism that writers festivals have traditionally exhibited. Who is listening and participating at these festivals is as important as who is invited to take the stage. While we are all aware that attendance figures are crucial to notions of success for any major event, Butler is on point when he prioritises the issue of audience demographics. Peril Magazine’s series on interviewing writers festivals’ directors proved extremely rich in content on this front. This interview with the Emerging Writers’ Festival (EWF) director Sam Twyford-Moore flipped the script in many ways and asked Twyford-Moore about what might interest Asian-Australian audiences at that year’s EWF, and why. EWF’s active interest in changing the status quo is evident in his responses, and detailed in this CALD writers forum resource. This brings us back to the question, flagged earlier, of what purpose cultural festivals serve. I reiterate my invitation to consider how you relate to the culture reflected in this year’s MWF. As Omar Sakr emphasises: 'As a writer, and even simply as a participant, an individual, it’s so crucial to see yourself and your culture reflected in art, to know you’re a part of the conversation, you’re not invisible' (Peril interview). Major cultural festivals are never just about what I want - I know that. The marginalising practices of reading, and engaging with Asian-Australian writers in mainstream media and events, have changed glacially since I started researching this topic, almost two decades ago. On the rare occasion when I find a program that reflects my interests to the degree this year’s MWF does, I am optimistic and grateful to the program coordinators for working hard to create an inclusive, stimulating space. To state the obvious, reading (and a huge amount of it) is necessary in order to write. We read about what we are interested in. Some people read everything they can lay their hands on. Maybe writing is a vocation of unhappiness. A quote I like about writing: from W B Yeats "Neither Christ nor Buddha nor Socrates wrote a book, for to do that is to exchange life for a logical process." 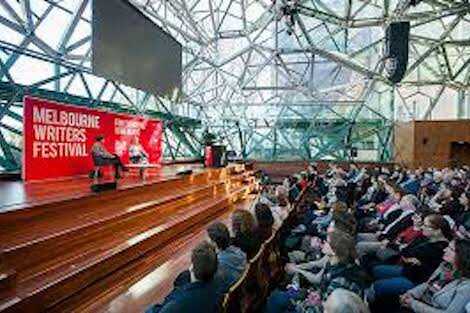 Writers festivals in our world seem to have made an art form out of the fairy tale "The Emperor's New Clothes". Perhaps your noble sentiments and considerations do not even get to the inbox of festival organizers and slavishly dependent attendees just wanting to touch the hem of the writer's garment. A major if not the major purpose of these events is to make money. Just that. My experience of the Sydney Writers' Week is that it is cultic. The hype in recruiting and engaging volunteers who contribute many thousands of dollar labour I found so alienating that I resigned. If a writers festival were a serious event there would be sessions and spaces devoted to writing, there would be the possibility of ongoing deeper discussion. There would be recording issues which emerge along the way throughout the whole event and which are serious matters for society. There would be a lessening of social entertainment activities, disappointing as that would be for the 'must be seen there' social butterflies. Having suggested these things to directors a few times the response was generally, "We are already doing that" or "Thank you for sharing". Writers write; they are not all equally good speakers. But if you want to buy the "Been There" tshirt you can buy the book and get it singed. Once Bob Dillon at concert in Perth said, "Reporters ask me what my songs are about. I tell them, "Listen to them". The word 'culture', especially with a large 'C', has been used for many purposes, so I am a wee bit wary of it, but I must say, in the way you use it, it seems pretty normal to me. Australia has certainly had an interesting racio-cultural history starting from before Federation. The camel drivers from the area which is now Pakistan and Afghanistan have not really left much, or any, real literature in English, nor have the Chinese diggers, or, of course, the early indigenous peoples, who did not have a literature. I wonder how well that wonderful collection of short stories 'The Time of the Peacock' by Ray Matthew and Meena Abdullah is known to the current generation of school children. It is both 'ethnic' and 'Australian'. I am not wildly happy about some 'ethnic literature' which does not also aim at the mainstream. The same with some indigenous literature. This is a rather exciting time in this country and I think it is in a process of healthy mutation. Long may that continue! The phenomenon of 'ghost writing' suddenly doesn't seem so cheesy and crass after considering Pam's comments! All those seemingly illiterate sports people and politicians who suddenly come out with best sellers might have more merit than we give them credit for. Ghost writing... spiritual revelation..... too far of a stretch?